South Africa's democracy inherited a health system biased towards tertiary rather than primary health care. Attempts to reverse this imbalance in the Western Cape led to rancorous response from many sectors. We outline the debate and describe the international forces that push developing countries into spending excessive amounts on specialised services. An alternative way of rationing, utilising cost-effectiveness thresholds, is described. The Western Cape's Health plan for the future (known as 'Healthcare 2010'1) included cutting back tertiary services to strengthen primary and secondary levels and to stay within budget. Tertiary hospital staff responded with indignation. A crisis committee was set up at Groote Schuur Hospital (GSH) and an often acrimonious debate ensued in the press and other forums. Bongani Mayosi, Professor of Medicine at GSH, explained the basis of the opposition in his submission to the Parliamentary Portfolio Committee on Health:2 not only is 'health in the Western Cape massively underfunded', but this is 'in the face of rising demand'. Professional staff numbers in academic hospitals in the province had decreased by 39% from 1990 to 2000, and Healthcare 2010 plans to further decrease specialists at the province's three academic hospitals from 235 to 115 by 2010. The net result would be a deterioration in patient care, waiting times and registrar training at these facilities. He believes the country's budget surplus gives us 'options for increasing investment in health'. According to Del Khan, Professor of Surgery at GSH, the net effect would be that GSH 'will continue to function, but we won't be producing the goods'. The GSH action committee chair, Lydia Cairncross, was more critical, stating that cuts to tertiary services exhibited a 'callous disregard for the lives of the patients entrusted to our care and to the care of the administrators of the health system', her submission to Parliament concluding 'I will give you one simple equation: health cuts equal death and suffering for our people'. The Democratic Alliance, Treatment Action Committee, and Cosatu expressed similar opinions in the press. Cosatu regional secretary, Tony Ehrenreich, explained that the cutbacks amount to the 'worst betrayal of provincial government towards the poor communities' and 'infringe the human rights of people who depend on public health care'. One of the reasons for South Africa's health care system being ranked 175th out of 191 countries in the World Health Organization (WHO)'s World Health Report 2000 was that we get poor value for money from our health system.3 Health care expenditure in South Africa is 8.8% of the gross domestic product (GDP), compared with a global average of 7.9% and an average of 5.1% for other middle-income countries.4 However, our health outcomes are very poor and we do very poorly at doing the basics properly. Proper treatment of tuberculosis and infant vaccination are two of the most cost-effective interventions, but South Africa manages a TB cure rate of only 59% and vaccination coverage of 1-year-olds of 82%.5 Socio-economic factors such as sanitation, employment and education are primary determinants of a population's health status. Evidence also demonstrates that health systems based on strong primary health care (PHC) are more cost effective at promoting the health of a population than systems biased towards strong secondary and tertiary care.6 By prioritising the establishment of good PHC services and dealing with social and economic factors, China, Cuba, Costa Rica and Sri Lanka had, as of 2004, attained life expectancies of 71 - 78 years despite annual health expenditures of US$43 - $290 per capita.7 South Africa spends $390 per capita, but our life expectancy is only 48 years.7 Even before the HIV epidemic our life expectancy was 10 - 20 years adrift of these four countries. 2. Prices of new therapeutic modalities are largely set in the developed countries since these countries comprise 80% of the pharmaceutical market.l2 Drug prices are determined not so much by the investment in their development but by how much pharmaceutical companies think that individuals and health care providers will pay for them.12 This in turn is established by factors such as how effective the new drugs are at promoting life and well-being over competitors. For example, highly active antiretroviral therapy (HAART), priced at US$11 000 per patient per year when released, was accepted by most health care providers in developed countries.13 However this price was unaffordable to most of the world's population, who live on under $2 per day. 3. Doctors are legally and ethically obliged to provide the best possible diagnostic and therapeutic modalities to each patient (the best practice imperative). The net effect of these factors is demonstrated in Fig. 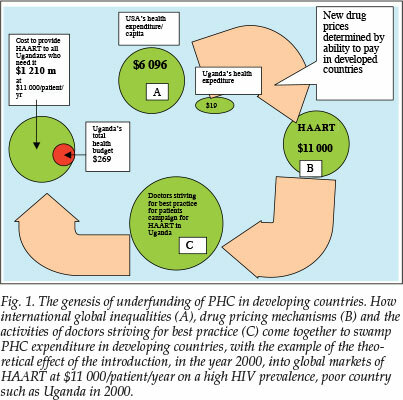 1, where we see the theoretical direction in which the best practice doctrine pushed Uganda's health care system in 2000, when HAART first emerged on the market. If Uganda had introduced HAART at these prices, it could have consumed 450% of their existent total health budget. Is there a way to ration THC that will protect PHC services? The WHO and the public health community agree that health services must be structured to provide maximum value for money.15 That involves favouring more cost-effective activities, which is consistent with the ethical view that limited resources for health should be allocated to maximise the health benefit for the population served. This rationale requires South Africa to divert resources to improve highly cost-effective PHC services such as curing patients with TB. Cost effectiveness also provides a powerful alternative way to ration THC services. The predominant form of rationing THC in South Africa has been to cut its total allocated budget (largely via imposed staff and bed cuts) and not to interfere in the package of services offered. This will result in the same package of care simply being offered to far fewer patients. An underlying rationale for this form of rationing is the perception that specialist-run services are inappropriately expensive and unable to ration themselves. An alternative approach would be to decide on an affordable package of tertiary care via the application of explicit criteria. This would have the advantages of making the rationing process more transparent and cost effective and would enable the benefits of THC to be delivered to a greater proportion of the population. Not cost effective: >3 times GDP/capita per DALY saved. It might be asking too much of a South African equivalent of NICE, at least in the short term, to determine the cost-effective packages of care at primary, secondary and tertiary levels. It could, however, help us to agree to a set of criteria to evaluate new medical technologies. While health planning textbooks suggest several criteria that should be used in this evaluation process, one of these should be a cost-effectiveness threshold. The utility of this approach is illustrated by a decision by the Groote Schuur Hospital Medicine Meeting to motivate to the Therapeutics Committee for the procurement of rivastigmine for the treatment of Alzheimer's dementia. The treatment would cost R12 000 per year for moderately slowing the rate of decline of the dementing process. None opposed the motion, as we have no nationally agreed frame of reference with which to decide if this is too expensive. What would the benchmark be of a claim that this was not cost effective? Of interest, NICE has just re-evaluated its recommendations on rivastigmine. Whereas before it was deemed cost effective for mild and moderate Alzheimer's, it is now regarded as cost effective for moderate disease only. Given the 10 times greater health expenditure per capita in the UK, it is very unlikely that rivastigmine would be deemed cost effective in South Africa at current prices. Seen in this light, the role of doctors is therefore to fight for all efficacious treatments to be available for all our patients, but to do so keeping sight of the bigger picture. Only if drugs are priced affordably should we be placing pressure on our national providers for their inclusion. If they are not, then we need to lobby at multiple (mostly international) levels to ensure that prices are lowered so that all our patients receive treatment on the basis of need rather than wealth.